Wondering what the lake here in Tuscaloosa is REALLY about? As a Realtor and someone who LOVES the lake we would be excited to take you on a private tour by boat. Get pre-qualified now at 205-451-5510 and we will help you find your little slice of Lake Tuscaloosa Heaven! Looking forward to an incredible season of BAMA Football, Tailgating and ending the afternoons watching the sun set on the lake! Why choose Lake Martin and 280 traffic when this little gem is right down the road! The most current article in my Lake Living Column can be found at www.druidcityliving.com on STAY-Cations. There is something magical about nature. Step out of the car after a long day and get a glimpse of a lake, a stream, or a tree in bloom and watch your cares drop away, at least for that moment. 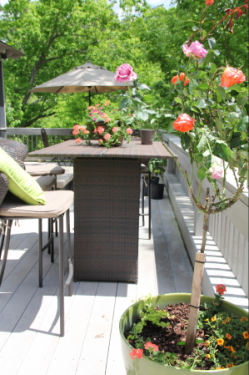 Here in Tuscaloosa, residents have the opportunity to enjoy year round access to the Black Warrior River, Lake Tuscaloosa and nature at every turn. 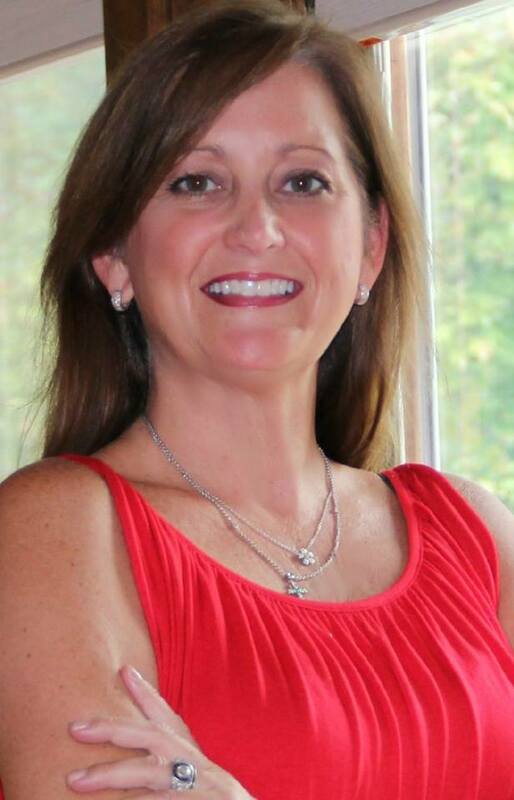 I moved to Lake Tuscaloosa from Birmingham in May 2013 after 10 years as a writer, artist and realtor. Birmingham has a couple of great community papers and magazines, some which I have written for. When I saw Druid City Living, I was excited. 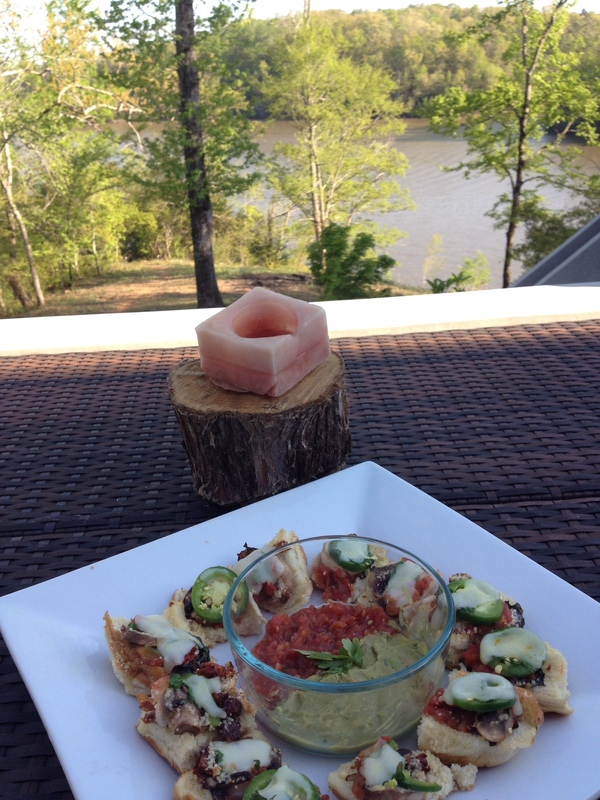 I begged for a chance to share all I love about living on Lake Tuscaloosa. It is my goal in this monthly column to write about unique activities that take place on and around the 177 miles of shoreline and the banks of local rivers and streams. Alabama boasts football, but we are also home to the greatest freshwater biodiversity in the nation. Combine that with mountains and sandy beaches and you have to puff up a bit when realizing this place is pretty spectacular. For this column, we welcome your stories, big catch photos, and look forward to interviewing those who make the waterfront their home. We will feature activities that take place on the lake. In my four or so years as a Bama student some years ago I crossed the spillway, but never explored the lake. I grew up near here in West Alabama (Livingston) and married on Lake Tuscaloosa. The intimate cabin at NorthRiver Yacht Club was to be the site before it became an extravaganza suited for the crystal room with 12 bridesmaids and 14 groomsmen. To say it is ironic that I will retire here with my husband of 10 years would be an understatement. I lived on the beach for four years. Before moving here, I lived in Crestline and we had a home on Lake Martin. Residents here may not recognize the unique, quiet, non-fluctuating treasure nestled in our own backyard. I’ll try my best not to share this with those in Birmingham who haven’t realized this is far better and closer than Lake Martin. 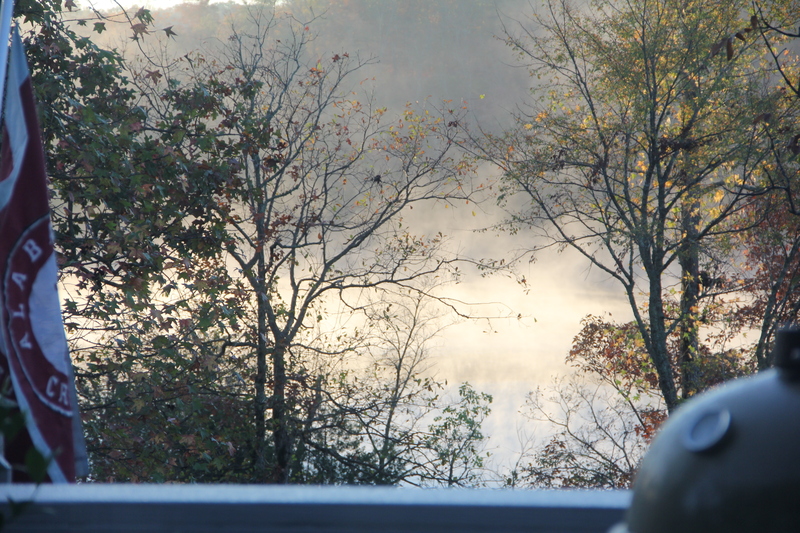 In the winter at Lake Martin, the water level drops significantly due to Alabama Power fluctuations. Here, I can barely see a change. Year round, when bizarre warm weather rolls across the cliffs, we could slip out on the water, or at least put our toes in at the dock. There are dozens of neighborhoods that call the lakeside home and a number of rural areas that keep her shores wild with deer and turkey. Just down the street from me is a parcel of land I dream of with a barn, acreage and water frontage. A stone’s throw from there is a public island ready for anyone to pop a tent and have a campfire and across the road, a quaint planned development with a shared pool and public boat docks. Cliff tops boast million-dollar refuges just beyond this tranquil spot. All of this is surrounded by Northport’s treasured artsy cuisine spots and convenient to grocery stores. It is less than 12 minutes (five miles north) from downtown Tuscaloosa’s great restaurants and shops. Make it a priority to get outside and soak in nature, whether in the woods or around any water. Blessings as we head into boating season. I’m looking forward to sharing your memories, both past and those you make this summer. I recently watched the PBS Special on Muscle Shoals. It reminded me of the diamonds we have here in Alabama, in terrain, beautiful cities, country lanes, beaches and mountains, and then there is the music. Watching acts like Bono, The Almann Brothers and the Stones talk about the “magic” in Alabama almost brought tears to my eyes. I got the same feeling recently when I got to hear Chuck Leavell speak his heart about music and forestry in the South. Chuck was guest speaker at the Savannah Book Festival, which I was able to read at during the Ossabaw Island Writer’s Retreat. His love for forestry won my heart. 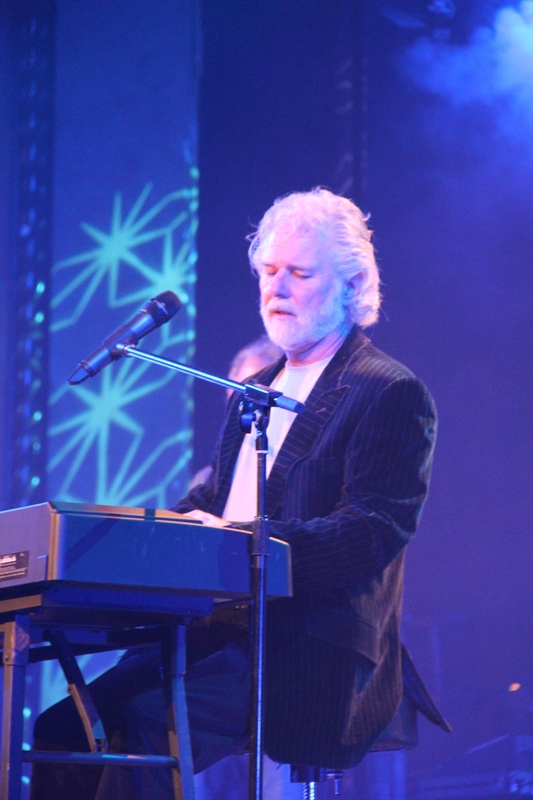 He and his wife share a special bond of love for nature and forest landowner as a profession as well as stewardship for the US. .
Chuck Leavell is no stranger to America. World tour keyboardist for he Rolling Stones, a Lifetime Achievement Grammy Award winner for work with the Almann Brother’s Band and in recent years, Chuck has been pianist on John Mayer albums, with Eric Clapton and even Miranda Lambert. He is also no stranger to Tuscaloosa, where he grew up after moving here at the age of nine. Many remember his band, the Misfitz, who performed on Friday nights at the YMCA just blocks away from The Bama Theatre when Chuck was back in town on November 8 with the Randall Bramblett Band to play a benefit concert for the Bama Theatre Restoration Fund. 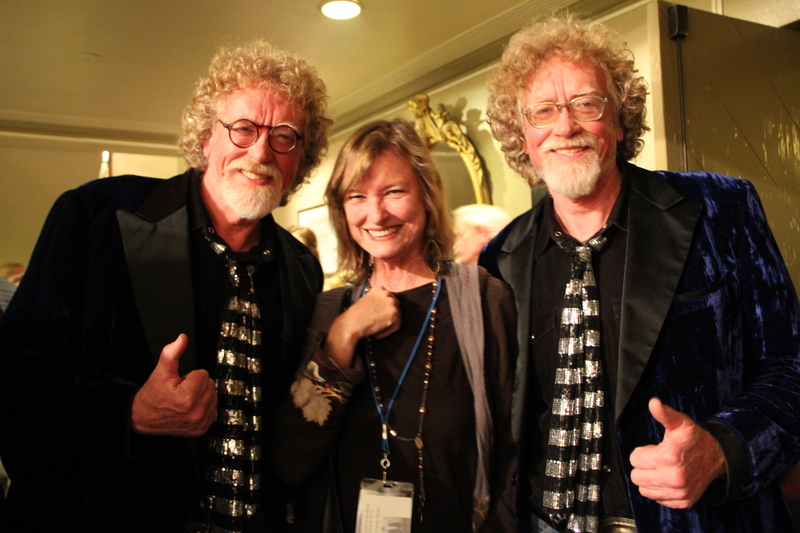 Chuck and his wife, Rose Lane, who have been married more than 40 years, greeted guests, old friends and chatted with some new fans after the show while he showcased his newest passion, writing. His latest, “Growing A Better America,” was showcased at the Savannah Book Festival. Songwriters such as John Denver, Jackson Browne and bands like U2 have been singing to the world about global issues, and like these, Chuck and his wife live out their message. They live on Charlane Plantation, 2,500 acres outside of Macon, Georgia, that were left to his wife by her parents. After years paying inheritance taxes to “buy back what was theirs,” they vowed to have it as a self-sustaining property. They have won numerous awards through the state of Georgia for their research and stewardship, and Chuck has been made an honorary Ranger. “Growing A Better America” highlights his research and ideas to make more productive in developing our greatest asset, land, with examples of projects that “do it right”. As a Georgia resident, it concerns him that the state is losing 19,000 acres of natural land a year. He has co-founded Mother Nature Network with 222,000 followers on Facebook. In recent months in Alabama, a “secret” private investor acquired 73,000 acres of prime timberland mainly used now for hunting and timber surrounding Birmingham. Perhaps that will remain green but who is to say? Unless we all take heart, we too may find ourselves without green places to roam. Alabama has the third most timberland acreage (22.9 million acres/ nearly 68% of the total land area) behind only Georgia and Oregon, according to the Alabama Forestry Commission. Being one of the only states with navigable waters that flow to the Gulf, there are also logistical advantages. Alabama is in the forefront for reforestation (begun in Alabama by pioneer E.F. Allison with Allison Lumber Company in Bellamy) as well as game management tactics he devised to assure that dwindling populations would turn into the boom of deer populations we see today. Timber expansion in Alabama is ahead of removal by 23 percent with 1.1 million acres since 1978 when numbers were at 650,000 acres according to amazingalabama.com. In Alabama, everyone has the opportunity to experience the woods, aspire to own land and cultivate the green space that God has given us. If we each, according to Chuck, just consider our individual carbon footprint we can make great strides in the right direction. 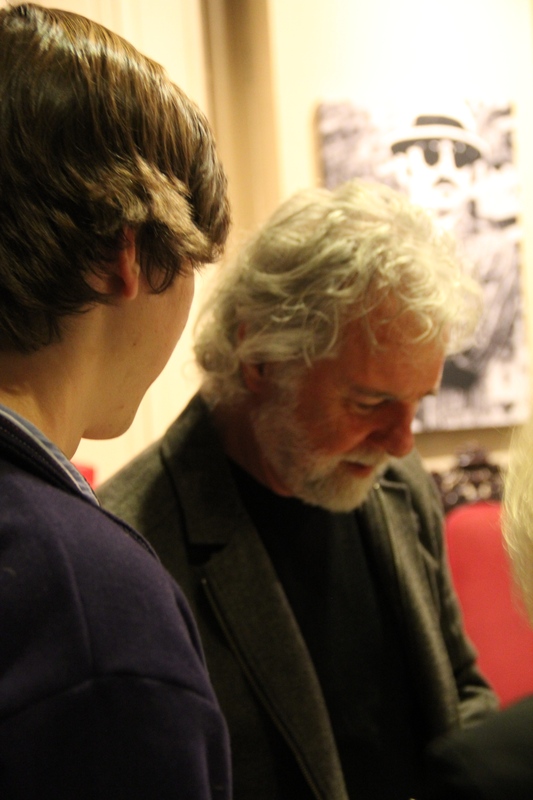 To learn more about Chuck’s book or his endeavors, find him at chuckleavell.com or charlane.com. Ed and Fred designed the guitar straps for the Rolling Stones. My son, Brent, is a music major in the New College at Bama with an emphasis in Production. I have found, in living on the beach as with living on the lake, that while we can set up tent on the shores of nature, God is in complete control. While residing for three years on West Beach in Gulf Shores, I became in tune with every breeze, display of sunset, and the ease of unwinding into the end of a day. I was aware of each popup storm that blew past, as it tossed umbrellas and spewed sand. We were forced to move inland at least three times because of hurricane threats and tropical storms, towing dogs, cats and kids. For the next 10 years, I lived in the city. I found I lost count of sunsets and even the shape and size of the moon most of the time. This past month’s ice event shut that city down, showing us that we can prepare, but we can never be ready for everything that nature has in store. I was in my home on the lake the entire week of “Snowpocalypse 2014.” All became still on Lake Tuscaloosa the day after the snow blew across the South, although I have heard there was a pontoon out that afternoon to take in the white wonderland vistas from the water. I watched as icicles formed, growing longer each day as the ice refused to melt. Tracks in the snow reminded me that these are not “our woods.” I actually had time to fill the bird feeder that I glance at on the way out the door to meetings and carpool, thinking maybe I should refill it, despite the squirrels. My dogs, who associate the woods with our camp house and freedom, we try to contain. Their excitement is buzzing as much as that of the kids in the neighborhood. Through their eyes we can re-connect with our inner child, embracing the magic of snow. On the lake, only a few days before the ice storm, I sat on my deck in shorts, soaking in the warm sunshine and watching a sailboat putter out to the point until it raised its sail, capturing the wind for fuel that would push it across the open water. Each day, as I putter back to home base, tired and hungry, I am reminded why we live. As an artist, as well as a writer, I look at life as art. “Colors are beautiful when they are significant,” I read in “The Art Spirit” by Robert Henri, beside a warm fire. He died in 1929, but any artist who has studied the notes from his classes realizes his wisdom is timeless. Life and spirit, I am convinced while surrounded by it, flow most naturally in nature. I look back on the ten years in the city and while I loved that time, I am happy to be back in the throws of nature. While in Birmingham, we took the time to explore every restaurant, outdoor cafe, music festival, and cultural event that we could fit into our weekends. We would drag the kids along, all in the name of “exposure to the things in life,” to Bible studies, art shows, festivals, garage sales, and plays. We would have date nights to motorcycling spots, RV adventures, beer pubs, wine tastings and fundraisers. We lost sense of what God was doing outside of our self-orchestrated circle of life. Today, just a few days after the ice has melted and a warm rain plummets on the roof across the rocky yard and into the lake, the waterfalls blast with activity to again remind me of the power of nature. Just beyond the hilltops I catch a glimpse of one ray of sun piercing through a cloud as it illuminates the water for only a second before fading back to shadow. Tonight, or perhaps tomorrow, or whenever Mother Nature agrees to move onward, I will make a point to step beyond the porch and find what that moon has been up to. Again, I have lost track. Maybe right now I am missing a rainbow as I write. Art is always being created by nature even when we aren’t looking. Here’s hoping you have a peaceful run-in with nature. Until we meet again, be sure to gather those photos of you and your love of nature, the lake, or your love for anything for that matter. Because in life, the greatest of all is love, and it is February, the month for no excuses! 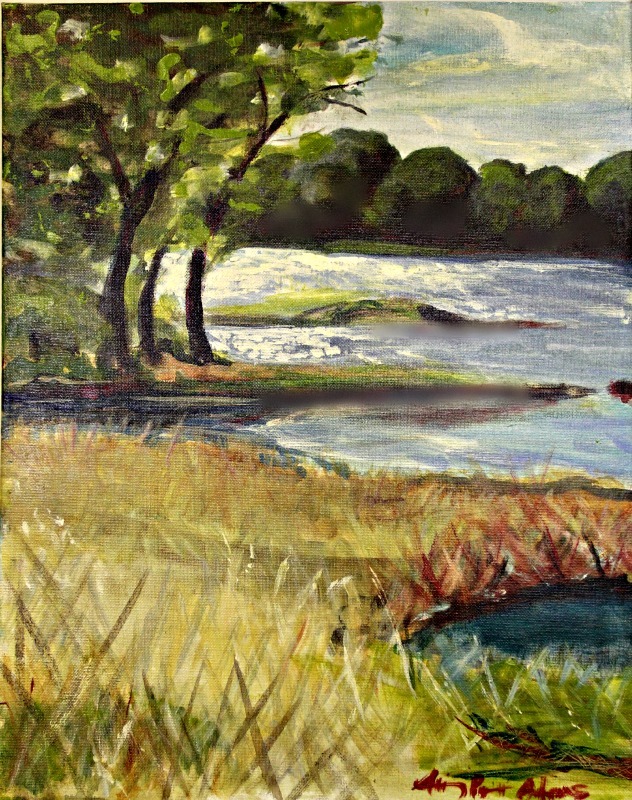 Colors of the Lake acrylic, by Allison Adams. As a mother to a boy who learned to play music by ear, this was dear to my heart. At the age of four, my son picked out the tune to Star Wars on a plastic piano. That was the beginning. 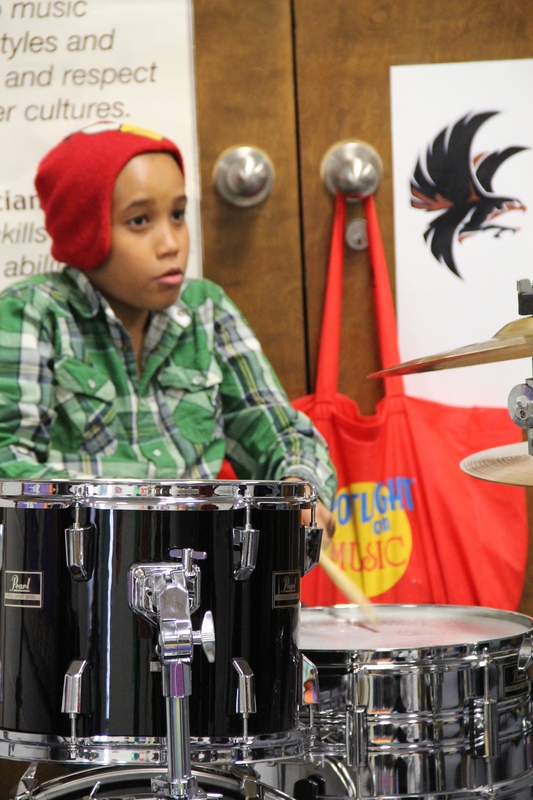 Groups like these bring music to kids of all backgrounds. My son performs with one of the volunteers for this program and hopefully will help in the future. Music is the common language in the world. During after school hours on Monday and Tuesday afternoons you can hear the pounding of drums, rhythm of guitar, magical vocals and the occasional harmonica trailing down the halls of Martin Luther King Elementary School. Each week The Alabama Blues Project shares the rhythm and magic of music with students who apply for the program, conducted in the schools by Anna Jenks, headed by Paula Demonbreun and made possible with talented local volunteers. “We are lucky to have talented local musicians with unique teaching styles. We can always use more help though, as we would love to see this expand,” Anna explained. The program currently runs for ten weeks in the Spring. The program begins with a class where the kids learn blues history, particularly Alabama blues. 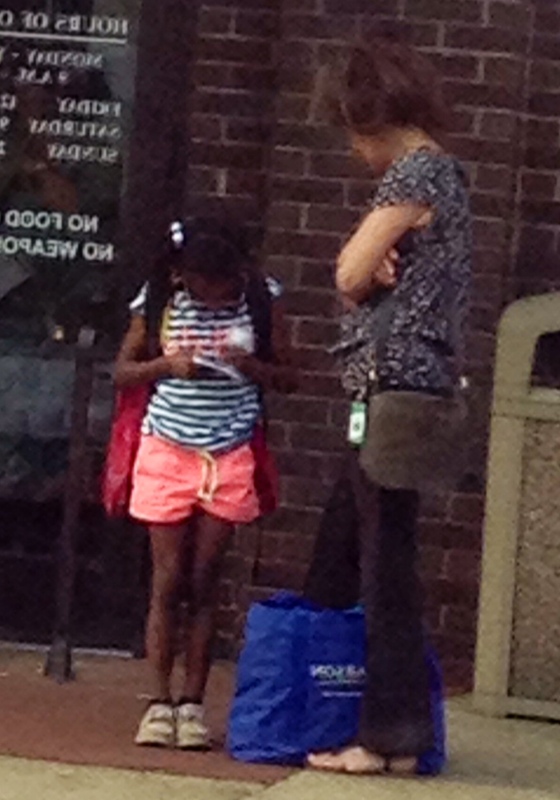 Music theory is introduced before they begin on instruments. Not only do they learn history of music all the way from the Blues to the current styles they hear and sing today, but they implement math concepts through beats and measure. The kids bond together through their common interests and grow in confidence as they learn to perform. There is emphasis on stage presence, which helps with confidence that they can carry throughout their lives. When they complete the first section of the course, they are then able to select their instrument of choice as the focus of the program. The program provides the instruments, and welcome donations. The website makes it easy for you to make monetary donations! In the drumming area, the kids used drumsticks on white paint drums to practice their rhythm. Dave Crenshaw, the percussion instructor, turns 10 gallon buckets over and the students create uniform poundings of sounds. The students learn to count complex rhythms but also to improvise early in his sessions. “One of the children, Mykian, who is ten, has really taken to the drums. He is a natural,” Anna explained. Mykian beams as he practices on volunteer Dave Crenshaw’s full set of drums. He is in the Advanced Band, and attends the camp through another school. To see him play is motivating to anyone witnessing the magic of music. The Camp has had visiting musicians such as Willie King, Little Jimmy Reed, Eddie Kirkland and Carroline Shines. Mike Battito is in charge of the Advanced Band which practices simultaneously with the camp. B.J. Reed, who also volunteers in area schools, leads the kids in vocals and cheers them on, encouraging them to step out of their comfort zone. Dave Crenshaw teaches drums. College students also get involved in the program. Dana, a college volunteer has been working with the current group. At the end of the Spring After-School Blues Camp the budding musicians perform in front of family and friends to share their new discovered talents. The Advanced Band participated in a performance at the Transportation Museum March 15th and will be performing in Tuscaloosa’s Got Talent in April. 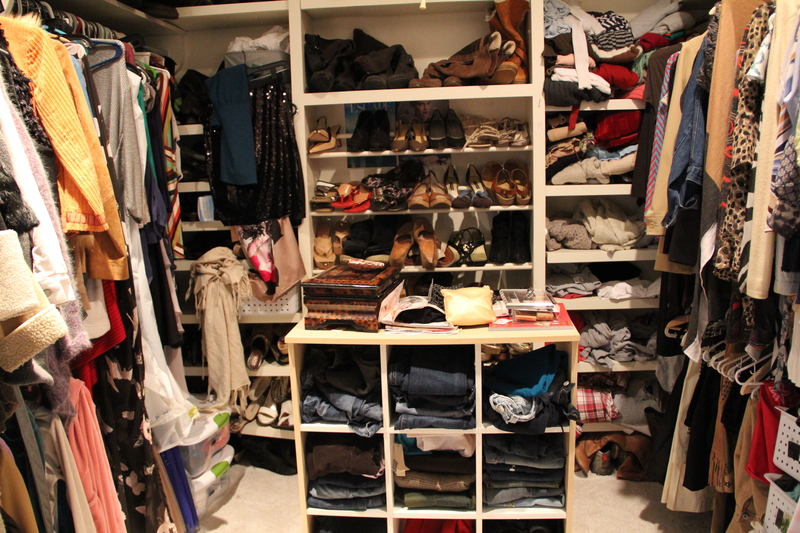 If you are like me, mornings are enough of a challenge without the worry of entering the war zone of the closet. Not only are you fighting with reruns of items, but also with the image of yourself fighting some stranger in your mirror when you pull out that outfit you thought was going to work as it always had. And the less time you have to get ready, the more difficult it seems to be to find something to throw on. And let me back up a second here, to address those who say they “simply threw something on in the morning”. I’m calling the bluff, as a person who routinely loses her closet beneath a stack of shirts that fit awkwardly, had a stain, pants that “used to fit”, and shoes that “looked so cute in the box” but look ridiculous on your foot when put with the outfit you purchased them with. Now there are some, lets just call them blessed, who can wake up and slap on a t-shirt and stylish exercise gear (theirs probably without the dog fur mine are coated in), pop their hair in a ponytail, slather a bit of gloss on their lips to highlight that natural blush they were born with and head out the door. They look refreshed, they look pulled together. I sit on the floor of my closet quite often and wonder where that person went, as I love to think I had that gift once upon a time. I’ve done a heavy clean of my closets only twice in my the past twenty of my 47 years. I still remember the items I miss, a long leather coat with a big hood I wish I still had when in the woods and a red cropped leather jacket with silver brads I wore during our Harley Davidson days, that was NOT a Harley jacket. I recently saw one in In Style and wondered why once again I let my friends strong arm me into “letting go”. So I may not ever wear it again, but dang-it, I would have the option if I felt the urge. Electronics were my thing. Give me a t-shirt and some jeans and I was happy. But, as an artist, I still enjoy putting outfits together. Every month I find a day to snuggle up with my fashion magazines. I tear out pictures of looks that I like. 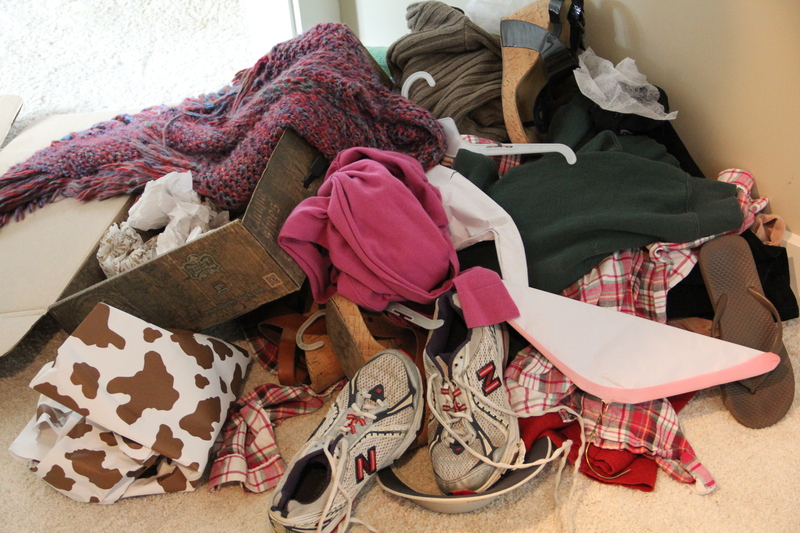 I dig in my closet, often finding nuggets to recycle or up cycle as I like to think of it. Photographed are a couple of examples of ways to pull in current colors and styles without going shopping every season. Who knew, buried under a fat stack of scarves I swore I would wear to some equestrian event,(Who knows! This is a horse city!) that I had a pencil thin snake looking belt that is “so” today, as shown in a recent magazine article? I put it with a straight line skirt like the photo and a blousy top, adding an updated ankle bootie (who knew, I fought those for years but they are growing on me) and what was old is new again. Now, I know, in sharing my secrets, I blow the image that all of us try to keep up, that we all shop every day, work out, play tennis and have nothing else to do with our time. I love being thrifty, and often frequent the second hand shops. What a gold mine to be in a college town where girls my size only wear something once then sell it! I am not too proud to share that! I’ve been told by my mom to “dress my age”. NEVER! I say, appropriate, ok, but not my age! The sun we have to avoid to keep the wrinkles at bay. I have no control over the facets of gravity, but my clothing, I have every choice! And I will go down with as many options as I can muster or drag around. Every little girl loves to dress up. Why should women be any different?Even if it is just to go the the grocery store! If we can’t still have fun dressing, then tell me, what is the point? While I am not a professional fashionista, I do have friends who are. 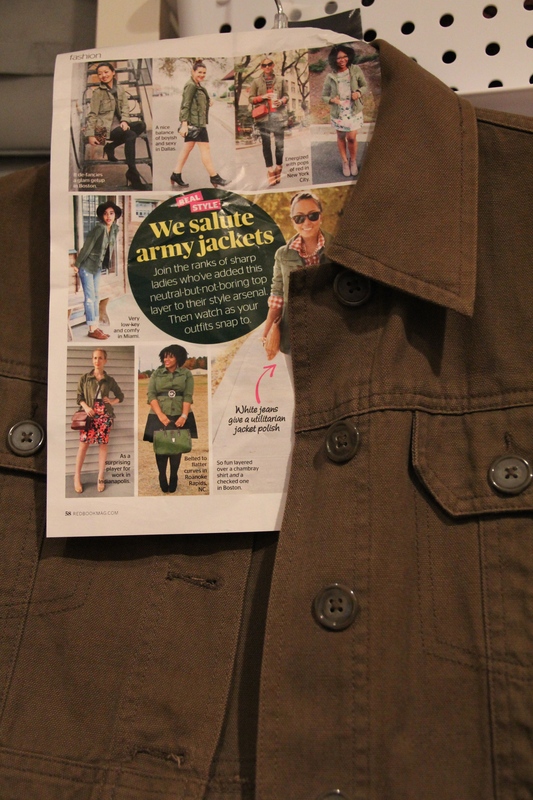 Here I have taken mine from the 90’s, with photo of the article and up cycled with similar items I own. ranging from 30 in the morning to 72 in the afternoons. Get creative with color and magazine photos. This years florals are the favorite. Feminine and fun. Proof I am NOT a hoarder…but dang I wish I had those wedges back. 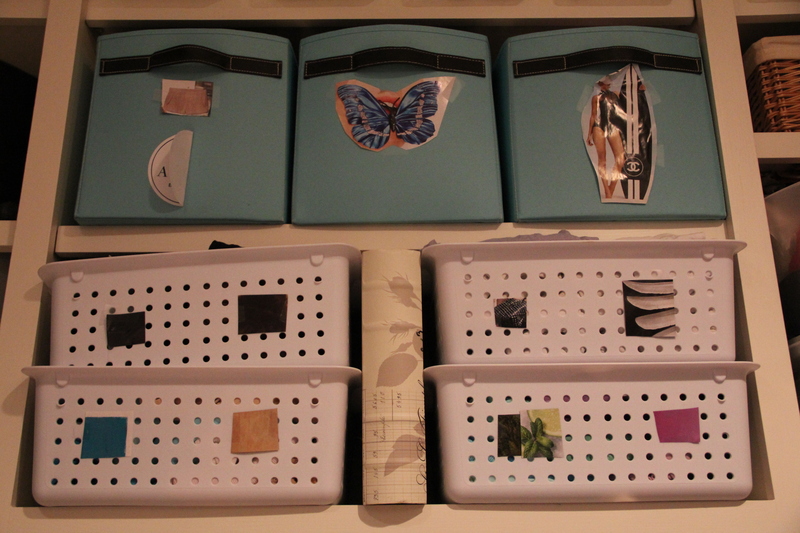 My closet BEFORE….color coding surely helps make the mornings easier. I was amazed and am including all photos I can. I also did one of the sets for them. I don’t have children at this school..but anything to help a friend. 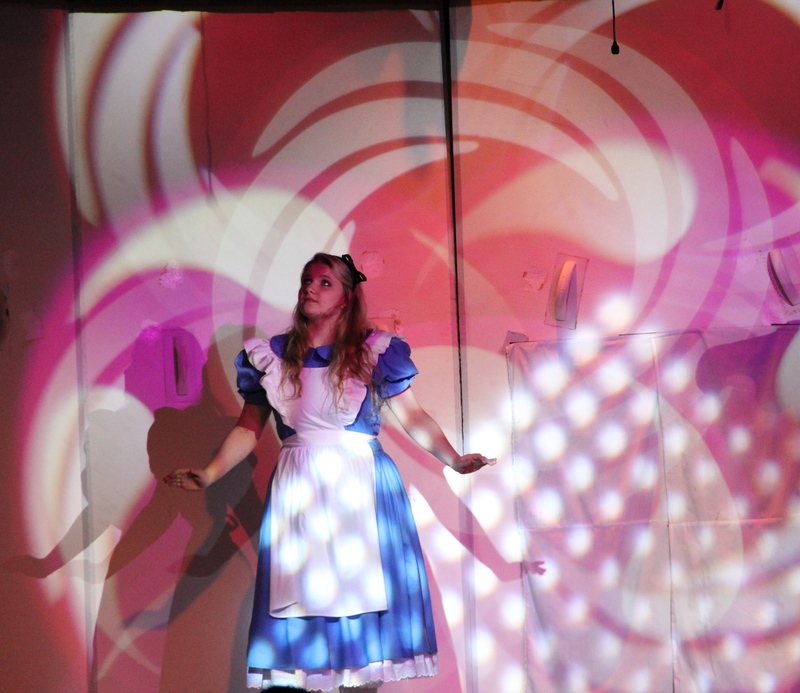 Holy Spirit School’s Fine Arts department presented Disney’s rendition of Lewis Carroll’s Alice In Wonderland Jr. on November 15 and 16. The production was directed by Liz Berta, with music direction by Anne McClendon and choreography by Kate Berta. A packed house was on hand for opening night. Maggie McGuire played the main character of Alice, with Maria Phelps as Tall Alice and Madalyn Mitchell as Small Alice. 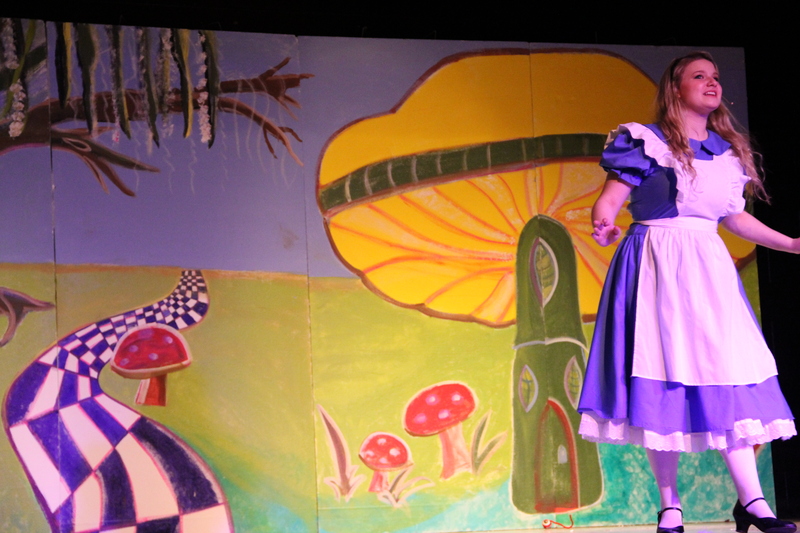 Emily Mitchell performed in her thirteenth production performance as Rabbit. Our neighbor and Ann Kats best friend in the hood is the little blue creature. Blanca Muniz, and Zach Davis. 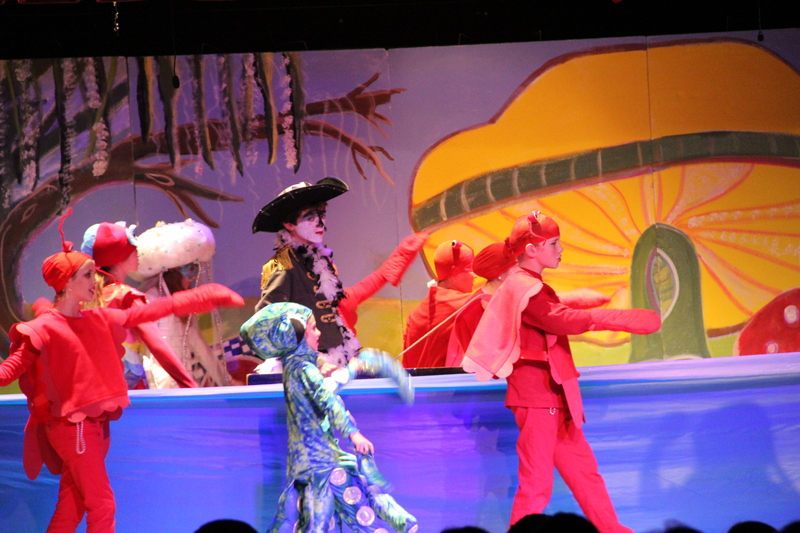 The actors ranged in age from six years old to senior students, and the choreography was impressive. All of the age groups blended together beautifully with the help of stage manager Augusta Elebash. made you forget you were in a school gymnasium. The sets and stages were all built for the production. 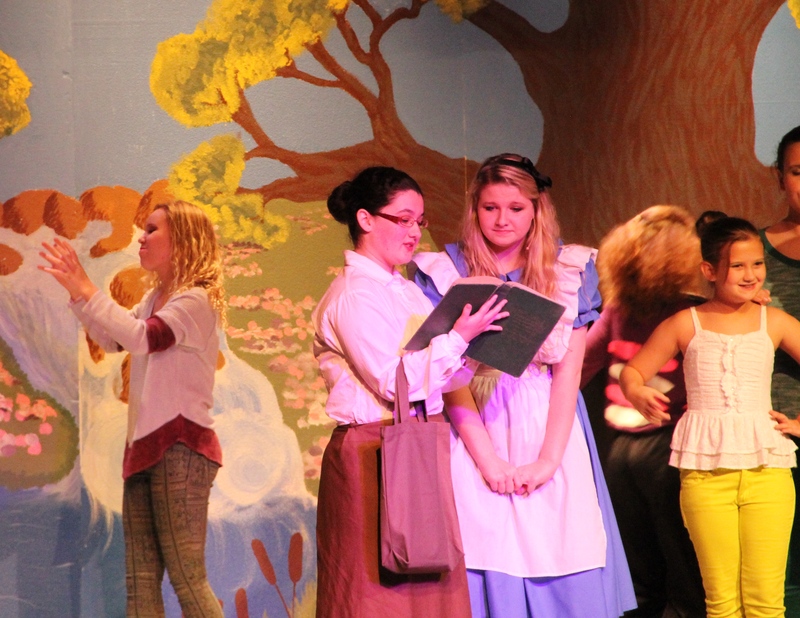 Sets were created by the director and music director, parents who created costumes, friends and the Holy Spirit art department students. This was the backdrop I painted. 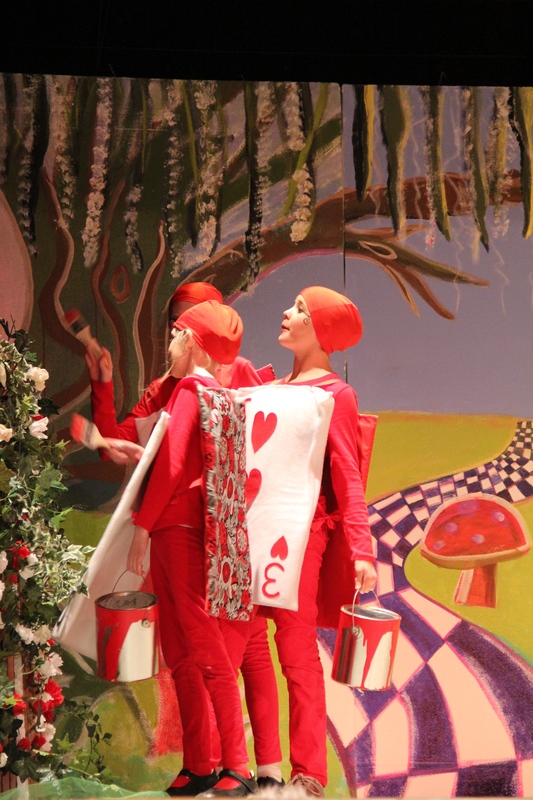 You can’t have Alice without a BIG mushroom. These were painted on four foam core panels similar to the stuff that wreaked havoc in real estate in the 90’s. Adams (painted mushroom set), LOS Construction and Roofing, Paragon Management Group, and Bama Bounders. Video images helped create magical transitions.